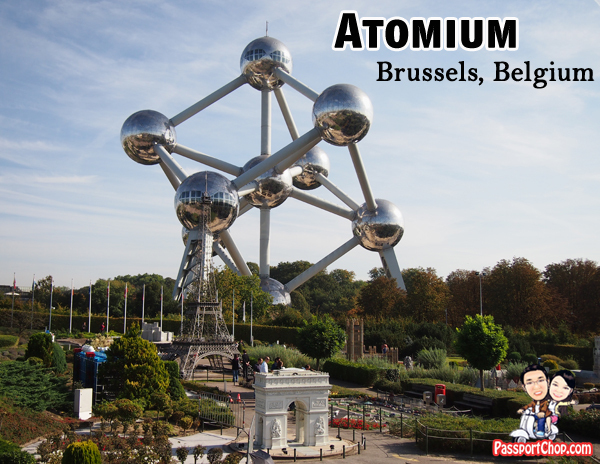 Just as iconic as Paris’ Eiffel Tower, the Atomium is one of Brussels’ most famous attraction. It shares a similar history as the Eiffel Tower as it was originally built for Expo ’58, the 1958 Brussels World’s Fair and planned to stand there for just 6 months. However, it became a symbol not only of the World’s Fair but also of modern architecture and the city of Brussels and of Belgium. It received monument status and stayed on the former exhibition grounds ever since. Designed by André Waterkeyn, it stands 102 meters (335 ft) tall. It has nine steel spheres connected so that the whole forms the shape of a unit cell of an iron crystal magnified 165 billion times. Tubes connect the spheres along the 12 edges of the cube and all eight vertices to the center. They enclose escalators connecting the spheres containing exhibit halls and other public spaces. Each sphere is 18 metres in diameter. The permanent exhibition – Expo 58: the exhibition showcases small-scale replica of different pavilions from Expo 58. These have been restored and created by Ghent University using archived documents to make sure the reconstructions were faithful to the originals. Using archived documents, photographs and videos from the era as well as countless models, this exhibition will take visitors on a journey back in time to this unforgettable, breathtaking event. 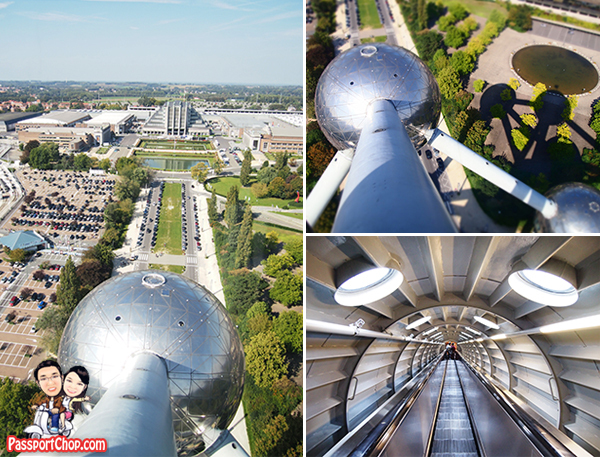 For some, this is the perfect opportunity to rediscover this enchanting experience; for others, who know nothing about Expo 58 and its passion for progress, this is a chance to learn about this magical time which still infuses the Atomium with its energy. The top sphere provides a panoramic view of Brussels and also boasts the Belgian fine-dining restaurant – Belgium Taste in the Sky. This top sphere can be reached via a lift that goes all the way up from the ground floor but be prepared for a long queue. The restaurant is then accessible via short flight of stairs just outside the lift. Essentially the top sphere is divided into 2 with the bottom half being the observatory deck for visitors and the top half being the restaurant. 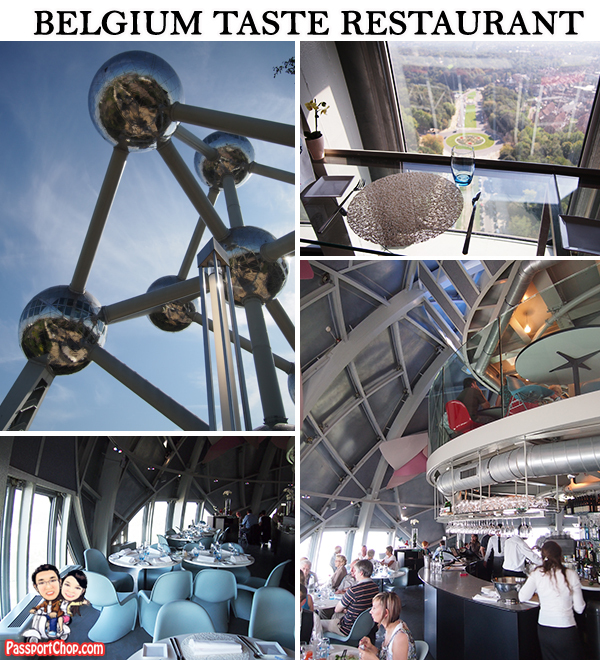 Besides boasting great views of the surroundings from the height of over 90 metres, the Belgium Taste restaurant also offers a great selection of Belgian cuisine. If you had yet to try any Belgian food, this is a good place to start as the restaurant offers a wide selection of food from around the region. Some of the dishes that you must try include the North Sea Waterzooi which is served with Cod, Turbot, Jacques Scallops, Mussels and Lobster. 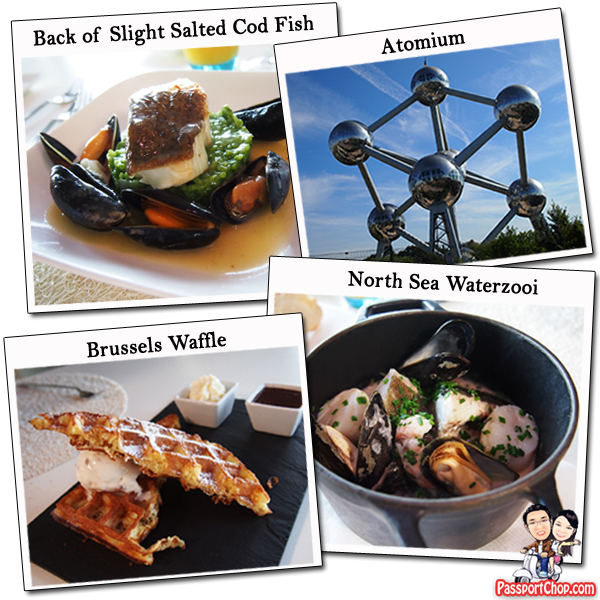 The soup perfectly compliments the various seafood served with the dish and at just 30 Euros, the price is almost comparable to the tourist trap restaurants along Rue des Bouchers and yet you can be assured of quality here at Belgium Taste restaurant at the Atomium. Another great dish that you should try at the Atomium Belgium Taste restaurant is the Back of Slightly Salted Fish served with Zeeland mussels, Green Risotto and White Hoegaarden (25 Euros). We have all heard of the world famous Belgium waffles – however be prepared for lots of disappointment with soggy waffles and overly sweet chocolate syrup when you try them in the city. The Brussels Wafle (8 Euros) at the Atomium Belgium Taste restaurant did not disappoint with its cripsy waffle served with a scoop of vanilla ice-cream. 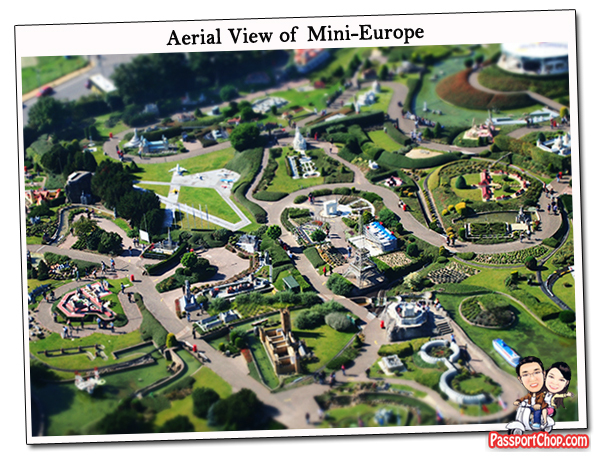 Besides offering a glimpse of the Brussels surroundings, you can even enjoy an overview of the key European monuments at Mini-Europe! Approximate journey time: 15 minutes. The Atomium is open every day, from 10am until 6pm (ticket office closes at 5.30pm). Different opening and closing time applies during Christmas and New Year Day and eve. Please check http://atomium.be/#/Prices.aspx for more details. Ticket prices for Adults (18 – 64) is €11. There are value-for-money bundled packages with nearby attractions e.g. Mini-Europe so check out http://atomium.be/#/Prices.aspx for more details. Looking forward to go here ..I want to experience the little Europe..Thanks for sharing..